The Viking 66 Convertible combines the builder’s traditionally aggressive profile with every high-end feature a tournament angler could possibly desire. Insane-O has recently had a new bottom paint and new cutlass bearings (5/17/17). Low hours, day head, tower, and, cockpit mezzanine! Motivated Seller!Trades Considered! Call to schedule your appointment to see her today! United Yacht Sales New Jersey would love to guide you through a personal showing of this 66' Viking 66 Convertible 2013. This yacht for sale is located in Palm Beach, Florida and priced at $3,289,000. For a showing please contact us by filling out the form on this page and we will get back to you shortly! The Viking 66 offers many of the latest accouterments. The salon features a day head aft for convenience when fishing. The island galley allows traffic to flow when entertaining. The 4 stateroom layout offers a crew quarters with head and engine room access in addition to 3 guest staterooms, each with private access to their own head. The bridge sports an island helm console with abundant electronics storage and 3 helm chairs so owners and guest can enjoy the experience with the Captain. The sleek lines give her that Custom boat appearance while the fiberglass construction and Viking engineering provide the speed, safety and ride that are synonymous with the Viking name. The boat is an outstanding example of a Viking 66 Convertible. The Captain has kept this boat in "Palm Beach" condition and all systems are go! 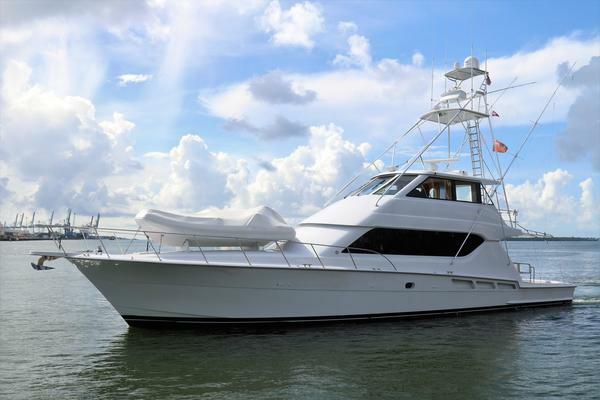 She is outfitted with all the right gear and ready for a new owner to move his gear on board and start cruising or fishing right away! Entering the salon, the Viking 66 boasts the island galley layout which has become the industry standard. The spacious salon features room for entertaining with a large L-shaped settee, and comfortable ottoman with storage. Additional guests will find the bar stools at the galley island comfortable and the dinette offers more comfortable seating. The day head is conveniently located near the salon door for ease of access from the cockpit when fishing or while entertaining. Moving forward in the boat, the galley shares the island with the salon and expands the spaciousness of this area. The under counter drawer refrigeration, electric cook top, microwave and plentiful storage in cabinets, bar storage, and drawers, all ensure that everything you need to keep your guests satiated will be at your fingertips. A pantry and equipment room offer additional storage for long ranging. The mid-ship master features an athwartship walk around king bed and ensuite head befitting the owner. The credenza, maple lined hanging lockers and drawer storage ensure that there is room for clothes for any occasion. The forward stateroom features another walk around bed, this one a queen, and also has an ensuite head for maximum privacy. The crew stateroom starboard aft has upper lower bunks and have a unique head arrangement down 2 steps that includes all the accommodations plus an engine room access door for doing those engine room checks without disturbing owners or guests. The starboard stateroom forward is another upper lower bunkroom and also offers private access to the starboard head.